Does your business need meeting space? We also offer our Board Room and the Toppan Room FREE to members. They make a great location to meet clients, hold training sessions, conduct interviews or just a meeting space for your business. The Chamber has free wi-fi available as well. Remember our facility is for use by members for presentation of informational, or educational meetings and programs in keeping with our mission. Bookings must be made by completing the online Meeting Request Form to make sure of the availability of our meeting spaces and be sure to read the complete Meeting Room Policy and Rules and Regulations for Meeting Room Use to determine if your request is eligible. 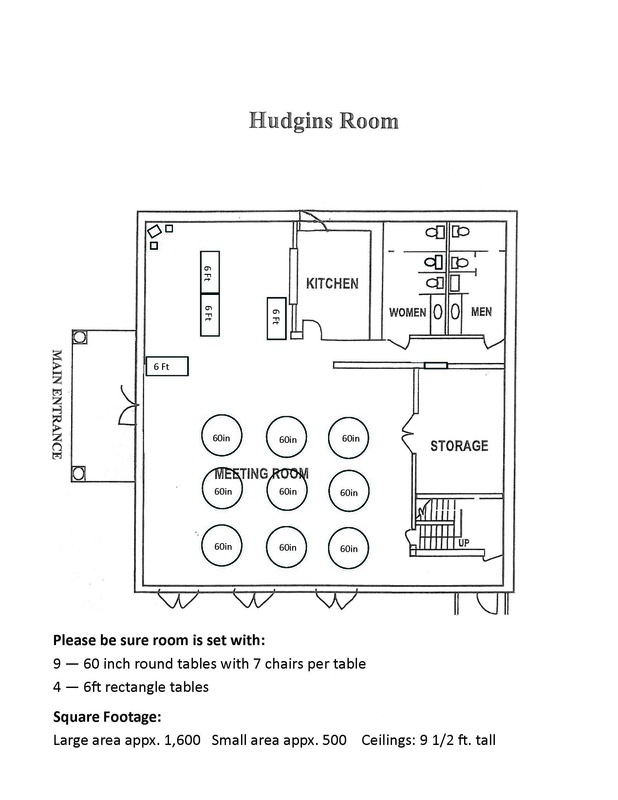 Click here to download Hudgins Room Overview. Whether you're planning a social gathering or business meeting, The Hudgins Room at the Henry County Chamber of Commerce is the ideal facility for your upcoming event. This upscale facility offers an attractive and affordable setting for your next event. The Hudgins Room's elegant, classic décor is appropriate for training seminars, holiday parties and wedding receptions alike and can accommodate groups of up to 100 people. A courtyard and vine-covered arbor provide a beautiful backdrop for photographs and pre-event festivities. 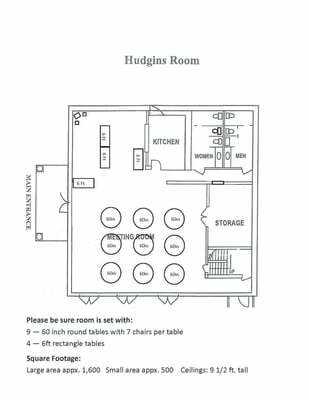 The Hudgins Room comes with a large catering kitchen, complete with ice-maker for your use. Please review rental agreement for alcohol policy. Smoking is not permitted in the Hudgins Room. Minimum rental is four (4) hours. Complete the Hudgins Room Request Form to check availability and secure date(s). Once your Hudgins Room Request has been received, a Chamber representative will get back to you within approximately one business day. A reservation is not guaranteed until the signed Rental Agreement along with full facility rental fee is received in our office. The rental balance, such as the security fee (up to $75.00*), Cleaning ($90.00), and damage deposit ($400.00/$200.00) are due 21 days prior to the event date. A single (one) contact person should be designated to oversee all arrangements. This will help to eliminate problems with communication and ensure a quality event for the renter. Facility set-up (if applicable) will be reviewed with this contact person when the key is picked up. Chamber staff reserves the right to cancel a rental agreement prior to the event if certain conditions exist. Possible reasons for cancellation include, but are not limited to: a declared state of emergency, unsafe environmental or health conditions, or interruption of utility service. In such an event, the renter agrees that the Henry County Chamber of Commerce shall have no responsibility for anything the renter may suffer or incur due to such a cancellation. The Chamber will attempt to notify the renter as soon as possible if such a cancellation occurs. All fees paid to the Chamber by the renter shall be refunded to the renter if the reservation is cancelled by the Chamber for any of the above reasons. Not quite what you were looking for?! Click on the link below for a listing of other event facilities in Henry County. When contacting the following members regarding their facilities, please let them know you were referred by the Henry County Chamber of Commerce.